Pakistan get SOMETHING right... Finally. Only Pakistan are capable of being decimated by the world's number 3 ranked team one day, and totally dominate the world's number 1 ranked team on another. Only Pakistan can drive such fluctuating emotions among the cricketing fraternity. 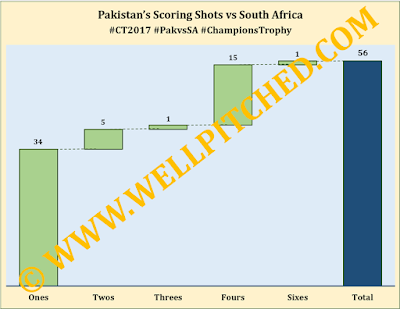 Everything from Pakistan's bowling to their fielding, catching, running between the wickets, and batting showed significant improvement. It was a massive turnaround. But let us not forget that South Africa are just as unpredictable as Pakistan are when it comes to ICC tournaments. South Africa have been and will always be easy pushovers in ICC tournaments. It was a great game for Pakistan, but it wasn't perfect. While many things went right for them, there were still some mistakes. 1. No Wahab Riaz for starters. Junaid Khan bowled beautifully with the new ball and then showed some great reverse swing skills at the death. Wahab has been lacking in both aspects for quite some time now. 2. Hafeez got to bowl. Why he did not get a single over against India will forever remain a mystery. His effectiveness against left handers could have come handy against Shikhar Dhawan. 3. Attacking fields ensured South African batsmen could not take easy singles. Sarfraz even had a slip after the 25th over, which resulted in a wicket. 4. It is amazing how a few quick wickets can make one field better. Pakistan's fielders looked unstoppable in the field yesterday. They were stopping runs, diving around, and just seemed to be every where. 5. Catches win matches. Who knows what India's total would have looked like had Yuvraj and Kohli been dismissed for 8 and 42 respectively. Pakistan's fielders held on to everything that came their way yesterday. 6. Fakhar Zaman. Just the sort of batsman Pakistan needs at the top. Again we will never know what took them so long to induct Fakhar into the ODI side. He looked authoritative at the crease, punished anything slightly loose, ran hard, and scored at a rate that all other Pakistani batsmen are unfamiliar with. Really makes one wonder why this team was not played against India, doesn't it? Despite the win, it wasn't at all perfect. There are still chinks in Pakistan's armor and significant scope for improvement. 1. Dot Balls. Pakistan played out 106 dot balls out of the 162 deliveries that they faced. That is huge percentage - 65% !!! Teams don't even play that many dot balls in their 50 over innings, let alone when they face only 27 overs! Pathetic really. The main culprits are the usual ones - Azhar Ali and Mohammad Hafeez. Why don't they learn? Why can't they at least take singles? Why must they seem so inept at the crease? Babar Azam looked like a transformed batsman as soon as Shoaib Malik walked out, who seemed to be batting on an entirely different pitch than Hafeez was. 2. Bowling changes by Sarfraz Ahmed left a lot to be desired once again. It is criminal to not allow your best bowlers on the day to bowl their full quota of overs. Hasan Ali and Imad Wasim bowled only 8 overs each. Imagine what Pakistan would have been chasing had these two bowled 4 more more overs. The two bowlers that completed their 10 overs were the ones with the worst economy. And your best bowler against India bowled only 5 overs. Our ODI captain has a long long way to go and learn. I hope Pakistan get keep on improving and once again become the ODI force they used to be. At least they are starting to make the right changes. A few more like replacing Azhar and Hafeez with younger and more aggressive batsmen, getting Faheem Ashraf into the XI, and moving Sarfraz higher up the order, can do wonders for this ODI team. For now, here's hoping they can repeat their performance against Sri Lanka and then let other match results decide whether Pakistan plays the semifinals or not.